The calculation of the solar power plant allows you to predict accurately the amount of electricity generated by photovoltaic modules (solar panels) for specific terrain conditions, provided in case all components of the system are mounted and connected correctly. Modeling tools use a series of mathematical equations to simulate power input and output values for specific electrical components, and then estimate PV system energy production on an hourly basis and aggregate these values to predict annual energy production. Industry stakeholders rely on performance model predictions for a wide variety of purposes: optimizing designs; informing proposals, contracts and performance guarantees; securing financing; calculating capacity factor; studying utility system impacts; and executing energy tests. System designers, integrators, project developers and researchers have access to both free and fee-based performance modeling tools to meet these needs. 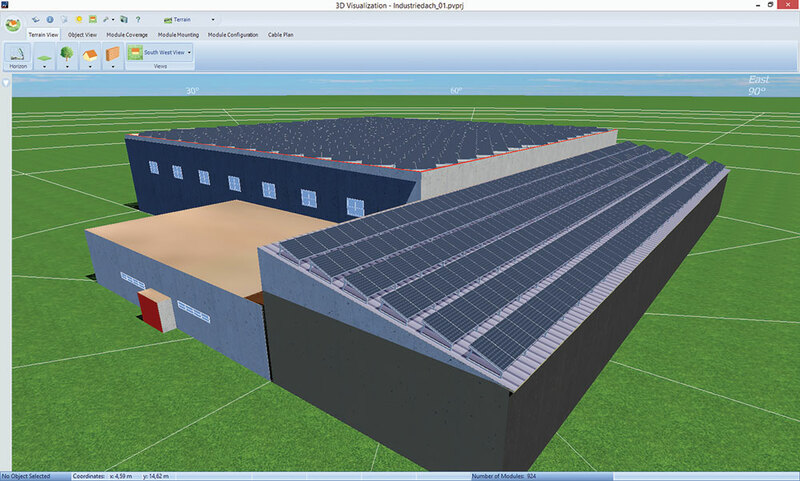 While working our system and project developers, engineers and installers, depending on the needs and tasks that need to be addressed, use both open (free) and paid simulation tools for solar power plants. Below is a brief overview of the software we actively use in our work. 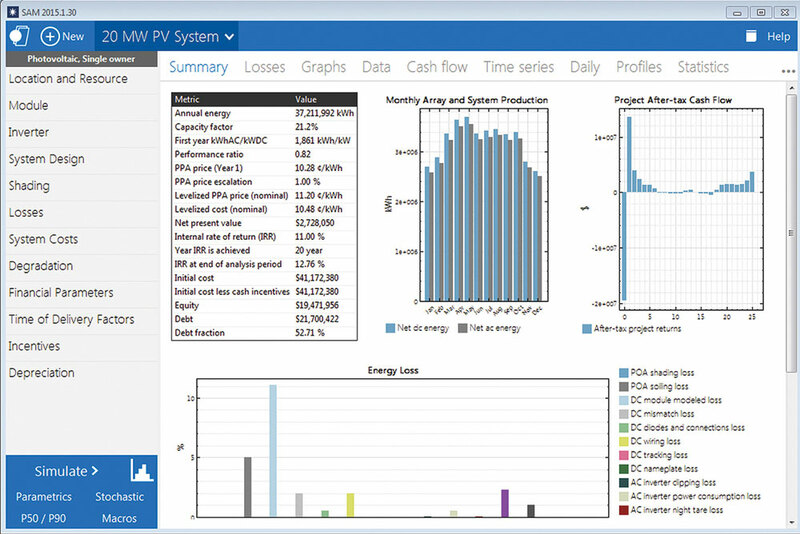 The National Renewable Energy Laboratory (NREL) offers two free grid-connected PV system performance-modeling tools, with somewhat different target markets—PVWatts, for residential system integrators or preliminary performance estimates on larger projects; and the System Advisor Model, for advanced user groups such as project developers and equipment manufacturers. PVWatts. 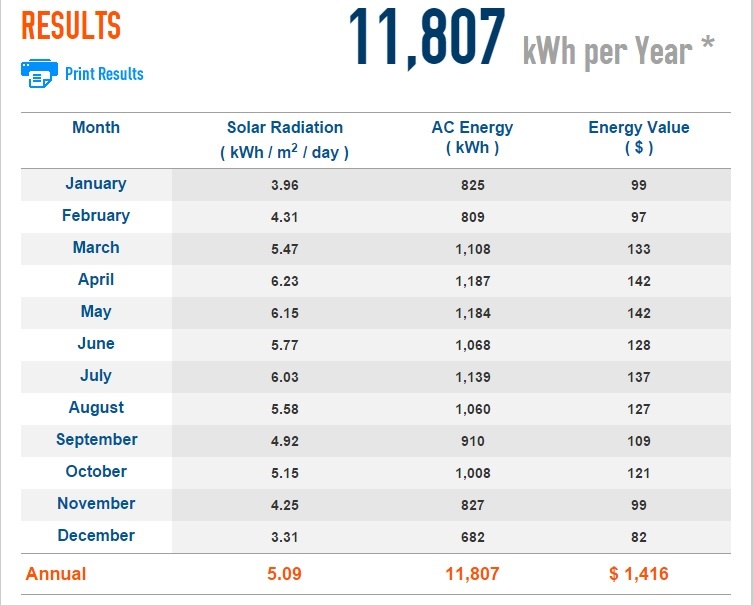 NREL released the PVWatts Calculator (pvwatts.nrel.gov) in 1999, billing it as “a performance calculator for grid-connected PV systems.” The cloud-based software platform is one of NREL’s most trafficked websites, attracting more than 20,000 users per month. The authors of the NREL report “Validation of Multiple Tools for Flat Plate Photovoltaic Modeling Against Measured Data” refer to PVWatts as “a relatively simple PV performance estimation tool [with few inputs] designed to give users a starting point for evaluating the feasibility of a PV system.” As such, users primarily rely on PVWatts for estimating residential PV system performance or generating preliminary energy estimates for larger systems. In September 2014, NREL released a new version of PVWatts that features an improved user interface and more-accurate algorithms. Whereas earlier versions of PVWatts assumed a default dc derate value of 77%, which notoriously underestimated system performance, the new version uses a default system loss percentage of 14% and generates 7–9% higher production estimates for fixed-tilt PV systems. The new version of PVWatts also allows users to select from different weather data, use a Google Maps–based roof layout tool, and specify advanced parameters such as dc-to-ac ratio and ground coverage ratio. Based on the specified ground coverage ratio, PVWatts now incorporates basic estimates of interrow shading losses for single-axis tracker systems with or without backtracking. However, PVWatts relies on single, static annual percentage loss factors to estimate the impacts of shading, soiling and snow on production. Efficiency is the only module or inverter performance characteristic that users can define in PVWatts. By comparison, all the other tools discussed in this article either include extensive inverter and module databases or allow users to import or manually input component-specific performance characteristics. System Advisor Model (SAM) NREL developed SAM (sam.nrel.gov) in 2005. It revises the desktop software program on an annual basis and released the most recent revision in June 2015. Like many of the other advanced modeling tools, SAM calculates PV system performance using mathematical submodels developed by governmental and academic organizations, including NREL, Sandia National Laboratories, the University of Wisconsin and others. For example, Sandia National Laboratories provides submodels used to define array and inverter performance. Richard Perez, a research professor at the University at Albany, State University of New York, created a widely used submodel for the complex process of translating horizontal surface irradiance values to plane-of-array irradiance values. The target market for SAM includes advanced user groups such as project developers, policymakers, equipment manufacturers and researchers. When generating performance predictions, SAM users can choose between the simple PVWatts model and a more granular model with user-selectable submodels. The latter option lets users model system production based on module- or inverter-specific performance characteristics, as well as account for losses due to environmental variables such as soiling or snow. The platform includes powerful statistical analysis tools that allow users to run Monte Carlo simulations or study weather variability via a P50/P90 analysis. SAM also has more in-depth financial analysis capabilities than many other modeling tools. Users can choose between eight different financial models for PV systems, ranging from commercial power purchase agreements to third-party leases. There are several new features in the June 2015 release of SAM, including the ability to build and animate a 3-D shading scene. Users can also import detailed shading loss tables—hourly data organized month by month—from survey tools such as the Solmetric SunEye or Solar Pathfinder. If snow depth data are available, the new version of SAM can be useful: it includes an innovative model for predicting energy losses due to snowfall on a PV system. The 2015 release also incorporates new energy storage modeling capabilities for lead-acid and lithium-ion batteries in grid-connected systems. Note that while SAM can individually model various renewable energy technologies—including concentrating solar power, wind and geothermal—it cannot model hybrid systems. A variety of vendors offer fee-based PV system performance modeling tools. HelioScope. Developed by Folsom Labs, HelioScope (helioscope.folsomlabs.com) is a cloud-based PV system design tool that also simulates system performance. Officially released in 2014, HelioScope is a relatively recent entrant to the modeling tool marketplace. Its target user group includes project developers, engineers, system designers and sales technicians. It can model both roof- and ground-mounted designs, and it supports both residential and commercial system designs. While Folsom Labs originally designed HelioScope to model fixed-tilt PV systems under 5 MW, the company plans to expand these capabilities. By the end of 2015, it expects to support array capacities of at least 100 MW, generate simulations for systems mounted on trackers, and model financial performance based on applicable incentives and utility tariffs. Folsom Labs offers HelioScope via a monthly or annual subscription fee. HelioScope features an intuitive graphical user interface that is quick to learn and easy to navigate. Rather than model PV systems in aggregate, like other platforms in this article, it simulates performance using a component-based model. It separately models each electrical component in the system and uses these granular data to generate a system-level performance estimate. A SketchUp plug-in allows users to define near-object shading and import 3-D models, which the program can use to calculate shading losses. 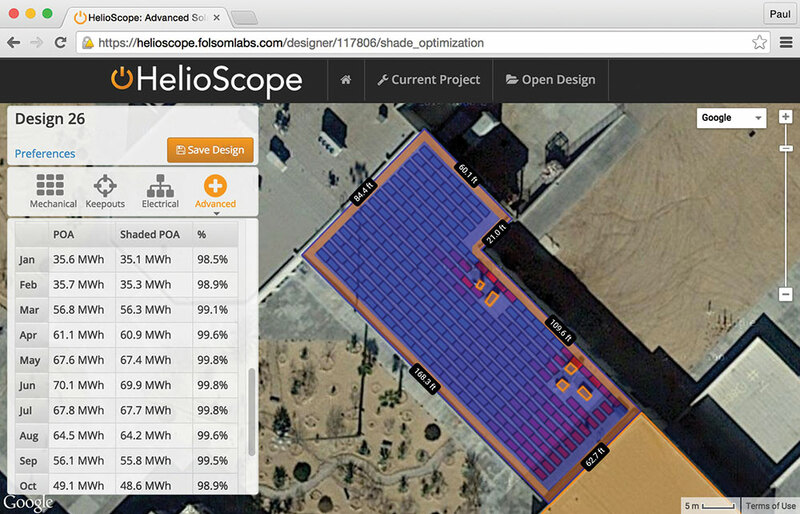 HelioScope users start by creating a physical layout of the PV system components layered on top of a Google Earth image. The software uses this physical layout as the basis for component-level computations. Users can also export these layouts as .dxf files to computer-aided design (CAD) software for further refinement, which can expedite the process of developing the construction plan set. Since HelioScope simulations are based on the physical layout of components, users can quickly analyze and optimize different design decisions, such as conductor sizes or system shade tolerance. The meteorological database includes NREL, SolarAnywhere and EnergyPlus weather data; users can also upload custom weather files. HOMER Pro. In early 2000, while working as an analyst at NREL, Peter Lilienthal developed the original version of the Hybrid Optimization of Multiple Energy Resources (HOMER) model. In 2009, Lilienthal and the core team that developed the legacy version of HOMER at NREL licensed the software and incorporated as HOMER Energy (homerenergy.com). In October 2014, the company released HOMER Pro, a completely new modeling product for optimizing microgrid designs. The target audience for HOMER Pro includes researchers, designers and system engineers working on stand-alone or grid-connected microgrids for villages, islands, campuses or military bases. HOMER Energy updates its software quarterly and offers both single-computer licenses and floating multi-seat licenses on a monthly, annual or permanent basis. The platform runs on Microsoft Windows operating systems. While HOMER Pro software uses a relatively simple equation to calculate PV array power output, it incorporates this function into a larger simulation engine capable of modeling hybrid microgrids, which are complex power systems with multiple energy resources. Users can model multiple power sources (PV, wind, micro-hydro, fuel cells, generators, combined heat and power), multiple energy storage technologies (flywheels, different battery chemistries, hydrogen), as well as advanced loads and efficiency measures. In a grid-connected scenario, users can also model multiple rate schedules, utility charges and revenue streams. The guiding principle of HOMER Pro is to minimize system life-cycle costs. For example, the software can simultaneously model hundreds or thousands of different system configurations and equipment options, and then sort and present each of these design iterations according to total net present cost. Users can employ the software’s optimization and sensitivity analysis features to discover how changing specific design variables—such as generator, PV array or energy storage system capacity—impacts system cost. Polysun. The SPF Institut für Solartechnik in Switzerland released the first version of Polysun in 1992 and founded the company Vela Solaris in 2006 to further develop and distribute the simulation software. Vela Solaris offers Polysun software at two user levels: Professional and Designer. Polysun Professional features a wizard-guided design interface, making it an easy-to-use sales and design tool for sales personnel or installers. Polysun Designer features capabilities such as inverter layout and shading simulation that are valuable to engineers, energy consultants, commissioning agents and other advanced users. The company automatically provides users with free software updates for 1 year, and it released the most recent version of its software, Polysun 8.0, in June 2015. The platform is available for both Windows and the Apple Mac OS. A distinguishing feature of the full version of Polysun Designer is its ability to model applications that combine multiple renewable energy technologies: PV (stand-alone, grid-connected, or grid-tied battery backup), solar thermal, geothermal heat pump, district heating and cooling, combined heat and power, and so forth. Users can generate tables showing hourly energy flows for any component in the system and evaluate these data to optimize system designs. The platform integrates the latest Meteonorm weather data, which includes more than 2,600 weather stations in North America. A horizon editor allows users to define near-object shading or interrow shading; alternately, users can import horizon profiles from site survey tools. Polysun includes simple financial and sales proposal templates, and the latest release expanded the battery catalogue to include lithium-ion chemistries. PV*SOL. In 1999, Berlin-based Valentin Software (valentin-software.com) released PV*SOL, the leading PV design and simulation software in the German market. The company established its US branch office in 2009. Valentin Software offers two fee-based versions of its PV system design software: PV*SOL and PV*SOL Premium (which replaced PV*SOL Expert in 2014). Compared to the base package, PV*SOL Premium offers advanced 3-D visualization capabilities and the ability to model SolarEdge power optimizers. Software maintenance support, including version updates, is free for 1 year. The company offers both products, which run on Windows operating systems, via single-user licenses. PV*SOL Premium is capable of creating 3-D renderings. While the software’s emphasis is on roof-mounted systems, users can analyze ground-mounted systems as well. The software includes a photo-dimensioning program that allows users to generate complex roof pitches based on an imported picture of the roof. It can visualize up to 5,000 PV modules in 3-D and up to 100,000 modules in 2-D. The program can model an unlimited number of PV arrays, each with different equipment and characteristics. The software simulates both stand-alone and grid-connected systems with energy storage, and includes a mathematical model for lithium-ion batteries. The platform integrates Meteonorm weather station data; alternately, users can upload their own weather data files. In 2014, PVsyst transitioned from version 5 to version 6. In addition to allowing users to upload customer weather files, PVsyst version 6 integrates Meteonorm weather data for the first time. The new version defaults to the Perez transposition model, which generally increases energy estimates by up to 2%. It allows users to model unbalanced inputs into multi-MPPT inverters. The platform also features an updated system loss diagram, which includes categories such as light-induced degradation, system unavailability, auxiliary or night consumption, and light-soaking gains for specific thin-film PV technologies. In version 6.11, the company introduced a weather variation analysis tool and a new page on the report for P50/P90 results. One of the significant differences between modeling tools is the accuracy with which they estimate shading losses for PV systems mounted on trackers. PVsyst version 6.10 incorporates new algorithms that more accurately model diffuse irradiance, which increases near-object shading losses. PVsyst users can build an animated 3-D shading scene in a CAD-like environment to analyze near-object shading; however, there is no way to automatically import these geometric shapes into the program itself. Users can manually define far-shading horizon profiles or import these data from site survey tools. Version 6 also allows users to import Helios 3D files for ground-mounted systems with terrain changes and automatically generate simulated module tables with varying tilt and azimuth angles.